I love this book. It all starts with the title, I think. 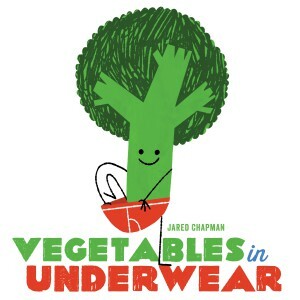 I love the whimsy and humor of picturing vegetables in underwear. This may be the case where you really can judge a book by its cover. If you’re not giggling when you read the title and see broccoli in red briefs, this probably isn’t the book for you. Everyone else, read on! Don’t call them underwear? No worries, the book helpfully supplies a bunch of synonyms: Drawers! Undies! Briefs! Underpants! Each is shown on a vegetable of a different size and shape: pea, carrot, celery, corn. For a child transitioning from diapers to underwear, this book provides encouragement in a very upbeat, humorous, silly way. But kids who already have the potty mastered may also enjoy this book, as it highlights a bunch of awesome vegetables. In addition to the aforementioned classic veggies, this book also depicts onion, eggplant, radish, mushroom, squash, turnip, potato, and a variety of baby veggies. My only hesitation in recommending this book is that it’s a classic picture book with paper pages, which may be too delicate for some early-adopters of undies.